Gas was the first utility service in the town, established by a local Board of Health in 1862. There was no public water supply, and sewage was removed from private closets by the night-soil men until after Bollington Urban District Council (BUDC) was created in 1894. The mains water supply from a bore hole at Rainow was established in 1899, and the sewage system in 1906 with a works at Lowerhouse. 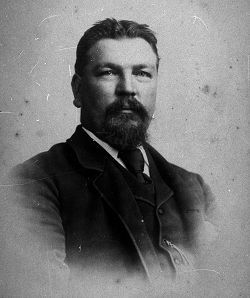 Pictured left is Henry Froggatt, for a long time the Superintendent of the gasworks. Some of the mills, such as Oak Bank mill, had their own gas production units but these would have been entirely in-house facilities producing gas for both processing (‘gassing’*) and lighting, and quite incapable of providing a public service. The public gas supply was provided from a gasworks in Princess Street (parallel to the lower end of Grimshaw Lane). This works contained a retort where the fuel coal was heated to drive off the gas, known as ‘coal gas’ or ‘town gas’. What remained was coke, which was a valuable energy source in its own right, and tar, and both could be sold. Various processes were used to purify the gas, before it was pumped into one of two gas holders to be stored – the two big round objects towards the bottom of the picture. The public supply came from these gas holders and was distributed through the town in pipes laid under the streets. This service continued until the 1960/70s, when ‘natural gas’ arrived, piped from wells beneath the North Sea. Once the town gas was no longer required only the gas holders would have been retained to provide local storage, but these, too, became unused and the gasworks was demolished. Houses were built on the site in the early 2000s, Spinners Way today. The gasworks suffered serious interruption when the Macclesfield Canal breached at Tinkers Clough during the night of 29 February 1912. There was considerable flooding of the gasworks and the retort fires were extinguished. Gasworks require a continuous supply of large quantities of coal. 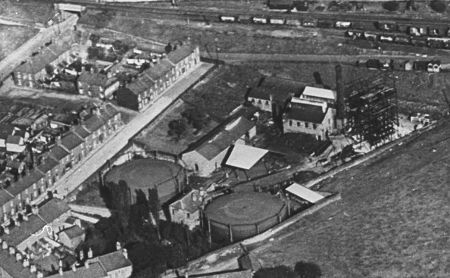 Bollington gasworks was located adjacent to the railway goods yard, and yet there was no direct connection between the two. Coal would have been unloaded from railway wagons into horse carts and taken more than a quarter mile via Grimshaw Lane, Henshall Road, and Princess Street, to be unloaded no more than 100m from the railway yard! 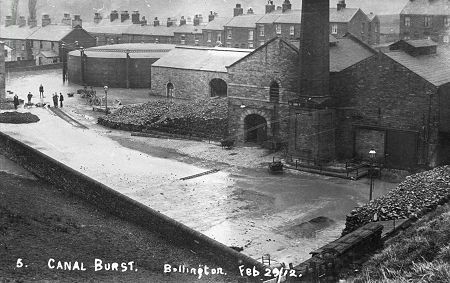 There was almost certainly some gas powered street lighting in Bollington, because this was one of the first uses for gas in this country. However, we would like to know of any evidence of this. There used to be a frame to support a gas lamp on a house at the top of Grimshaw Lane, but that has gone now. There is just one remaining gas street lamp in use locally – the gas lamp outside the half-timbered house at the road junction in the middle of Pott Shrigley. This ancient lamp is retained and always lit! * Gassing – a gas flame was used in the cotton mills to burn off the whiskers from the cotton thread to produce a cleaner and more shiny product.